Calopogonium brachycarpum (Benth.) Benth. ex Hemsl., Calopogonium orthocarpum Urb., Stenolobium brachycarpum Benth. Calopo (Calopogonium mucunoides Desv.) is a vigorous, hairy annual or short-lived perennial trailing legume. It can reach several meters in length and form a dense, tangled mass of foliage, 30-50 cm deep. The root system is dense and shallow, at most 50 cm deep. The stems are succulent, covered with long, brown hairs. They are creeping in the lower parts, sometimes rooting at the nodes that come in contact with the soil. The upper part of the stem is twining. The leaves are up to 16 cm long and trifoliate. The hairy leaflets are 4-10 cm long x 2-5 cm broad, ovate to elliptical. The inflorescence is a slender hairy raceme that may be up to 20 cm long and bears 2 to 12 blue or purple small flowers. The fruits are 3-8 seeded hairy pods, 2-4 cm long (FAO, 2011; Cook et al., 2005; Chin Chen Peng et al., 1997). Calopo is mainly used as cover crop, alone or in mixture with other legumes, especially in rubber, oil palm or in young forest plantations. Calopo is used for green manure though its value for this use still needs confirmation. Calopo is a pioneer species: it provides soil protection against erosion, reduces soil temperature, improves soil fertility and controls weeds (Cook et al., 2005; Chin Chen Peng et al., 1997). Although not widely used, calopo is the most popular legume amongst Brazilian farmers and is the legume seed produced in greatest volume in Brazil (Pizarro, 2001). Calopogonium mucunoides can be grazed and made into hay or silage. Cattle will especially graze it during the latter part of the dry season (Cook et al., 2005). Its good persistence under grazing might be a way to improve overall pasture quality through enhanced soil fertility, subsequent higher pasture growth rate and weed control (Chin Chen Peng et al., 1997). One commercial cultivar, derived from plantation agriculture, has been developed in Brazil (Cook et al., 2005). Calopogonium mucunoides originated from tropical Americas and the West Indies. It then spread widely and is now found in most humid tropical areas (Africa, Asia, Australia). It was introduced in Indonesia and Malaysia as a cover crop and became naturalized. It is considered a weed in some regions (US Forest Service, 2011). Calopo is found from sea level up to an altitude of 2000 m in Colombia but will do better between 300 and 1500 m (Chin Chen Peng et al., 1997). 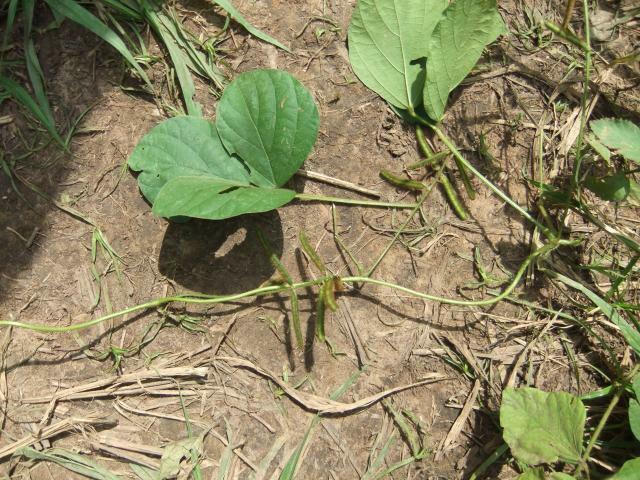 Calopo is a warm-growing legume that prefers hot and humid tropical areas (Ecocrop, 2011). Its optimal growth conditions are daily temperatures ranging from 24°C to 36°C (Cook et al., 2005). It persists well with annual, well-distributed or seasonal rainfall above 1000 mm up to 1500 mm (Kretschmer et al., 2001; Chin Chen Peng et al., 1997). Calopo can withstand flooding conditions. It can grow on a wide range of soils, but it does better on acidic clay soils (pH 4.5-5). It is tolerant of high aluminium saturation but not of saline soils. Calopo is not frost tolerant. It has poor drought tolerance, though it can persist through seed germination after drought (Cook et al., 2005). Fire also kills the plant but seeds survive and regrow easily on ashes after a burn (FAO, 2011). Calopo is moderately shade tolerant and can grow in plantations where light transmission is between 60 and 100%: it remains productive under coconut palms (at 60-70% light transmission), but lower light transmission reduces yield and heavy shade can kill the plant (Cook et al., 2005). Calopo seeds can be broadcast on the ground, mixed with ashes or oversown in natural pastures (FAO, 2011). Calopo establishes readily after seeding and can cover the soil after only 3-6 months, or even sooner in newly cleared, fertile land (Chin Chen Peng et al., 1997). It can be sown alone or in mixed stands with tall tropical companion grasses such as Panicum spp., Hyparrhenia spp., Setaria spp., Brachiaria spp. and Melinis spp., and persists with pangola grass (Digitaria eriantha) if carefully grazed (FAO, 2011). It is oversown into signal grass (Brachiaria decumbens) pastures in Brazil (Cook et al., 2005). 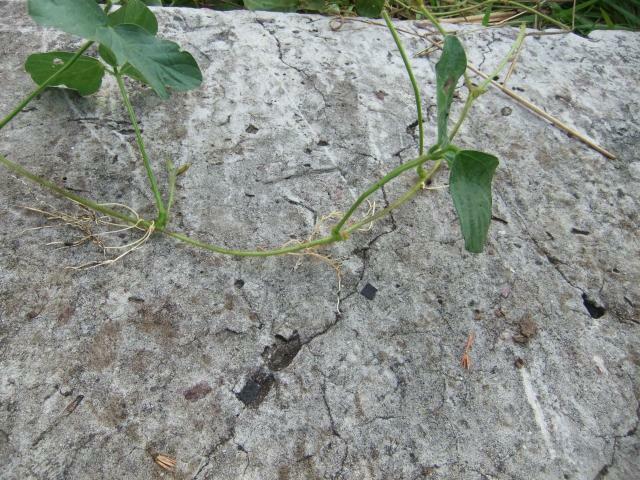 Calopo is also often sown with centro (Centrosema molle) and tropical kudzu (Pueraria phaseoloides) in green manure mixtures to give early cover, after which kudzu and then centro persist (FAO, 2011). In coffee plantations, it is sown with Desmodium ovalifolium (Wintgens, 2009; Cook et al., 2005). Calopo can be grazed or cut and fed fresh. It can yield up to 14 t DM/ha if it is harvested in a single cut when pods are already mature. When cut every 9-12 weeks, DM yields are about 4-6 t/ha (Chin Chen Peng et al., 1997). When calopo is grown as a perennial, DM yields decrease over years (FAO, 2011; Cook et al., 2005). It is recommended to graze it rotationally with rest periods of 8 to 12 weeks (Chin Chen Peng et al., 1997). Calopo is rarely made into hay or ensiled, though this is possible. It may be used as deferred feed to combat drought but has a low nutritive value (Cook et al., 2005). It becomes an important part of the diet during the dry season when other species have disappeared (Giller, 2001). Calopo provides large amounts of leaf litter onto the soil, smothering most weeds (Chin Chen Peng et al., 1997). Calopo may also have some allelopathic effects on seeds and prevent weed development (Souza Filho et al., 2003). Calopo is one of the species that can help controlling the noxious weed alang-alang (Imperata cylindrica) (Friday et al., 1999). Calopo is an N-fixing legume that has no specific requirement for rhizobium and nodulates readily. It provides soil N to neighbouring grasses when it is sown in mixed stands, and to the following crop when intercropped (with maize for instance). Its effects can last 14-16 years (Chin Chen Peng et al., 1997). It is a valuable green manure in rice fields where it is tolerant of stagnant water conditions (Kretschmer et al., 2001; IRRI, 1988). It is used as cover crop in plantations (banana, coffee, rubber, palms, black pepper) but should be prevented from overgrowing the trees by regular cutting (Parthasarathy, 2008; Chin Chen Peng et al., 1997). Due to its agressive development and allelopathy towards the seeds of other species, Calopogonium mucunoides can become a localized weed in humid-tropical environments. It is considered a weed in tropical ecosystems in northern Australia (Northern Territory and Queensland), in the Philippines, Malaysia and Indonesia and in many Pacific Islands (Samoa, Mariana Islands, Cook Islands, French Polynesia) (US Forest Service, 2011; Cook et al., 2005). Like many other legume forages, the nutritive potential of Calopogonium mucunoides lies in its protein content (Lim Han Kuo, 1967; Evitayani et al., 2004). However, a rather wide range of protein contents has been reported, from 5% to 24%, depending on the material eaten (full browse or leaves), position on the plant (the top of the plant is more nutritious) and stage of maturity (Asongwed-Awa et al., 2003; Ikhimioya et al., 1996; Cook et al., 2005; Evitayani et al., 2004; Feedipedia, 2011). No toxicity has been reported (2011). Calopo is seldom grazed alone and mostly used in mixed pastures with other grasses and/or legumes. Hay and silage are made but no research has been reported. Calopogonium mucunoides has a low to moderate palatability though it is considered more palatable than Calopogonium caeruleum. Calopo is consumed more readily after cattle become accustomed to it. This is the only palatability problem reported (Cook et al., 2005). Its lack of palatability is due to its hairy stems and leaves, particularly when the plant is fresh (Asongwed-Awa et al., 2002) and calopo will be more readily accepted if it is wilted before being fed to animals (Cook et al., 2005). Palatability improves when the forage matures (Asongwed-Awa et al., 2002). Taste or odour may also play a part: in sheep, where voluntary OM intake of Calopogonium mucunoides was only 400-500 g/d, the addition of taste-modifiers (monosodium glutamate (2% DM fed) and molasses (5%); or with sodium hydroxide (4% w/w or its molar equivalent of potassium hydroxide) resulted in an immediate and sustained increase in OM intake of about 40% (McSweeney et al., 1986). In vitro digestibility of Calopogonium mucunoides leaves ranges from 58 to 66% depending on the age of regrowth and level of hairiness. High densities of epidermal hairs (34 hairs per mm²) are associated with lower in vitro dry matter digestibility (Cook et al., 2005; Pizarro, 2001). In Cameroon, lactating zebu cows grazing Calopogonium mucunoides had a milk yield similar to that of cows grazing natural pastures, and much lower to that of cows grazing Stylosanthes hamata. This poor performance was due to a low intake of calopo pasture (resulting probably from palatability issues) that was still manifest even after several days of adaptive feeding (Asongwed-Awa et al., 2002). In Brazil, Brachiaria decumbens and Brachiaria brizantha pastures oversown with Calopo mucunoides grazed by cattle at 3.1 head/ha resulted in higher live weight gain per animal and per area than the pure grass pastures, averaging 390 and 340 g/steer/day, and 404 and 352 kg/ha/year, respectively. The major contribution of the Calopo was to increase the crude protein content of the animal diet and, consequently increasing animal production, both during the dry period and the wet period. However, the legume percentage decreased linearly from the first to the third year under grazing (Euclides et al., 1998). The seeds of several tropical legumes, including Calopogonium mucunoides, have potential as feed supplements for ruminants as they are very digestible and rich in nitrogen. 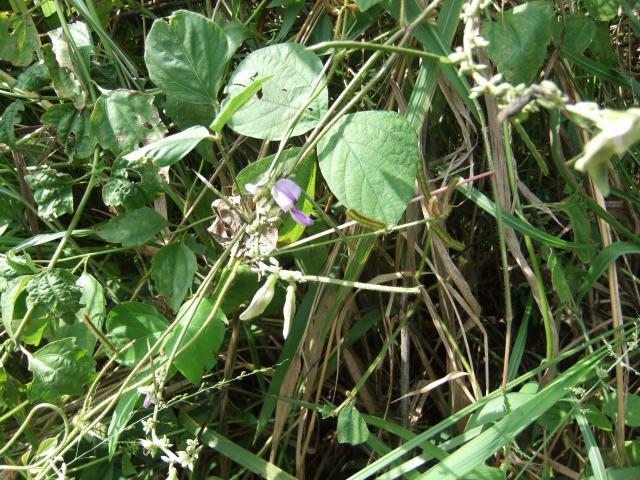 In addition Clitoria ternatea and Calopogonium mucunoides appear to have potential as defaunating agents (Odeyinka et al., 2004). In draft donkeys fed 2.5 kg/day of calopo hay with a supplement mixture, the digestibility of the calopo diets was higher than that of the control maize straw-based diet. Intake was slightly lower, but not significantly so, an indication that palatability of calopo was less of a problem in hardy animals like donkeys, well adapted to arid and semi-arid zones and able to benefit from a relatively good protein and nutrient source such as calopo (Asongwed-Awa et al., 2003).